This region was once known as ‘Kathiawar’ ~ the word Kathiawad means the land of the Kathis, a Rajput tribe who migrated to the region in the 8th century and controlled the southwestern peninsula of contemporary Gujarat. Before Indian independence in 1947, most of Kathiawar was divided into numerous princely states, ruled by local potentates who acknowledged British suzerainty in return for local sovereignty. After Indian independence, the Princely states of Kathiawar acceded to India. Now it is Saurashtra, also known as Sorath or Kathiawar, is a peninsular region of Gujarat, located on the Arabian Sea coast. It covers about a third of Gujarat state, notably 11 districts of Gujarat, including Rajkot District. Now they play Ranji and have the likes of Cheteshwar Pujara and Sir Ravindra Jadeja in their ranks. Recently, Chairman of the senior national selection committee, MSK Prasad heaped rich praise on Cheteshwar Pujara, calling him a "modern-day Buddha" after the India batsman played a key role in India's historic Test series win in Australia. Prasad insisted that Pujara is turning into a role model for young cricketers in the country and that he is going to inspire a generation of traditional Test cricketers, who are considered endangered species in the T20 era. One would recall that famed Indian Triumph on Feb 3, 2018 at Mount Maunganuj, New Zealand – in ICC Under-19 World Cup Finals. The score card would read : India U19 217 for 2 (Kalra 101*, Desai 47*, Gill 31) beat Australia U19 216 all out (Merlo 76, Uppal 34, Anukul 2-32, Shiva Singh 2-36) by eight wickets. India sauntered to a record fourth Under-19 World Cup title in front of a partisan crowd of 4000 odd at Bay Oval, to finish an unbeaten campaign that had begun against Australia at the same venue three weeks ago. The margin of victory then was 100 runs, and it was comprehensive in the grand final as well - eight wickets. In winning the tournament, India pulled off their second highest successful chase in U-19 World Cups, after the 226 to beat Australia in Townsville in 2012. Unmukt Chand had led that chase with a sublime century, as another Delhi boy, Manjot Kalra, reprised the feat. In the tournament opener against Australia, Kalra had missed his century by 14 runs in an effort to hit out; he was unbeaten on 101 off 102 balls in the final. The finisher was Wicket-keeper batsman Harvik Desai with 47* ~ and in a land where you have so many young Wicketkeepers in the fray including Rishab Pant, Ishan Kishan, the keeper for Saurashtra in this match is Snell Sukhdev Patel – Harvik Manishbhai Desai is playing as an Opening batsman .. as the keeper Snell Patel has been doing pretty well for Saurashtra - today, too, he scored 72 - there was no place for Desai in the side. However, an injury to Avi Barot, a regular Saurashtra opener, just before the start of the tournament threw up a vacant opening slot. Saurashtra coach Sitanshu Kotak took the gamble of playing Desai as a pure batsman and the 19-year-old didn't disappoint. Now in the 2nd Quarter Finals at Lucknow (Jan 15-19, 2019) - Uttar Pradesh made 385 & 194 and Saurashtra 208 & chasing mammoth 372 won by 6 wickets. 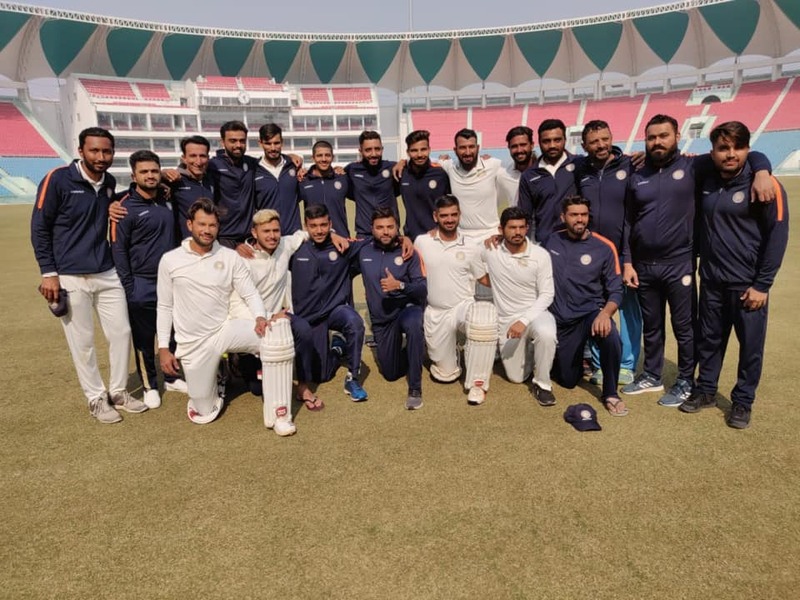 Vidarbha and Saurashtra pulled off victories over Uttarakhand and Uttar Pradesh on the final day of their Ranji Trophy 2018-19 quarter-finals, to book their berths in the semi-finals. Saurashtra will face Karnataka to try and get into the title round, while Vidarbha will take on Kerala. Chasing a mammoth total of 372, Saurashtra got off to a solid start with Harvik Desai, the opener, scoring a 259-ball 116. With wicketkeeper-batsman Snell Patel scoring 72, Saurashtra's got a 132-run opening stand. Saurashtra were in a spot of bother after losing Kamlesh Makvana cheaply and then Desai in a span of six overs. However, Pujara did what he does best control the temp of the game with a well-paced 110-ball 67. Notably, Pujara suffered a rare failure in the first innings when he was dismissed for 11 in the first innings by young U-19 World Cup-winning pacer, Shivam Mavi. Harvik Desai's maiden first-class century helped Saurashtra pull off the highest chase in Ranji Trophy history, breaking the previous record of 371 set by Assam against Services in the 2008-09 season. Saurashtra, the visiting side, began the day on 195 for 2, still 177 adrift. With 136 runs still needed, Desai's wicket gave some hope to the hosts, and the new ball was taken after the 85th over. But Pujara and Jackson batted sensibly, mostly playing with soft hands. The UP seamers drew a couple of outside edges but they fell well short of the slip fielders. Earlier, Vidarbha took only eight overs on the fifth day to wrap up victory by an innings and 115 runs against tournament debutants Uttarakhand in their game in Nagpur. Umesh Yadav and left-arm spinner Aditya Sarwate picked up five wickets each to bring a swift end to Uttarakhand's second innings for 159. This is only the highest run chase in 4th innings ~ not the highest – in the famed Ranji Trophy, in between it became an unwritten rule that Toss is the most vital. The winner bats first without hesitation, amasses runs - amass runs mostly by staying put, wear down the opponent and win by First innings lead. My memory takes back to the finals in 1981/82 at Delhi in March 1982. Karnataka played first. Roger Michael H Binny scored 115; Brijesh Patel 124, stylish Sudhakar Rao 71, Kirmani 116, Ranjit Kanwilkar 116 – as they were all out after 255 overs making 705.